between meetings and work. It has been raining, though, which prevents me from doing much rabbit shearing. Damp rabbit wool isn't much fun to work with, although I imagine it's easier to handle than wet sheep! Despite the wet weather we had a nice weekend at the shop. My new neighbors opened their bookstore; more on that at Life in Meadows of Dan. I'm proud that I'm starting to get some regular customers and a couple of people that are becoming friends came by. 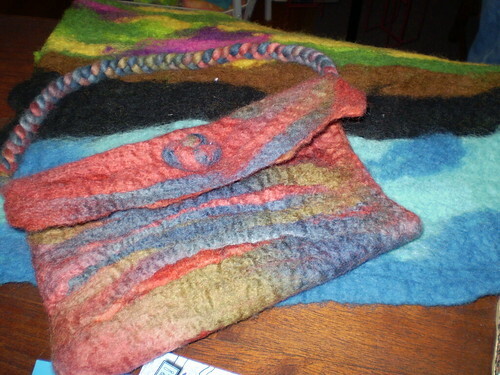 Barbara from Vesta visited on Sunday to show me her lovely felted projects. I adore the purse, made with fiber she purchased here from one of my vendors. The tapestry beneath is a work in progress, and will be a splendid mountain scene when she's finished! I've spent most of the weekend writing articles and working on a new shopping cart for the Greenberry House web site, so it was a rest for the eyes and mind to get out yesterday. 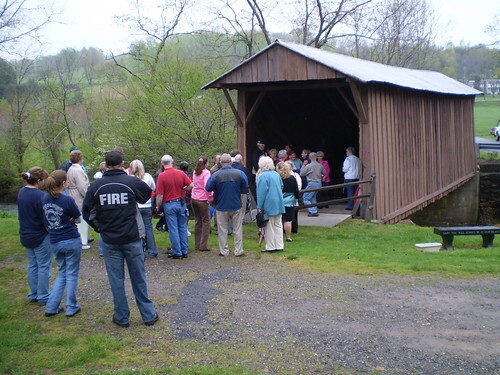 Despite the rain, I had a pleasant trip down the mountain to Woolwine for an event featuring the presentation of a grant to restore one of Patrick County's two covered bridges. 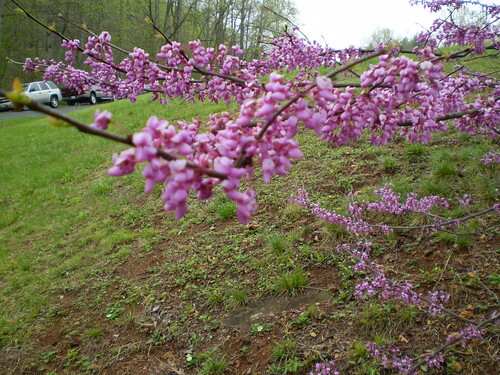 Redbud is still in bloom and dogwood is starting to brighten the edge of the woods and lawns. I ran across the top of the mountain into a wall of fog, but below the ridge it was only raining. A few drops fell while we were standing at the bridge but they didn't dampen the event. Woolwine is tucked in under the mountain; if you want a real adventure take Belcher Mountain Road down. In the spring I wouldn't go that way, though, especially after weeks of rain. At one time, I understand, Woolwine was called Rock Castle; the present name came from a prominent family in the region. Along with the covered bridges, Woolwine has wonderful views, great people and some lovely apple orchards. It's one of the many areas of Patrick County that doesn't get the attention deserved by the place or the people. I hear that's a great new restaurant in Woolwine, too, but I haven't been able to get to visit. 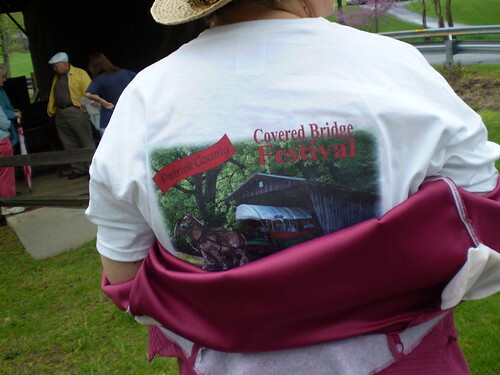 The Covered Bridge Festival takes place every year in June; it's June 21 this year. Music, food, crafters (I'll probably be one) and lots of fun time visiting with the locals. Come see us if you can! On the way home I came across this odd fellow. He was standing bolt upright on the pavement at the edge of the road, for all the world like a tin soldier at attention. His back was ramrod straight and his bill was straight up in the air. I stopped, backed up and got out of the car and he never moved. His entire attitude was "You can't see me" even though he stood out plainly against the wet pavement. 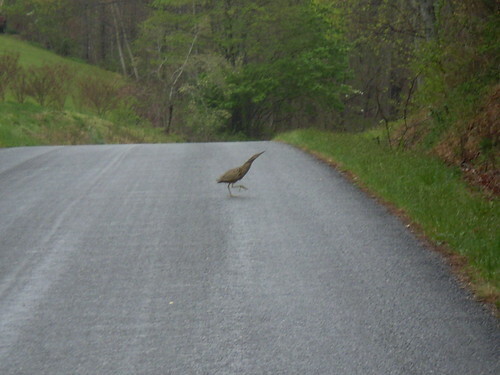 By the time I got the camera out and set it for a close-up picture, he settled out of his "invisible" pose and started ambling lazily across the road. I suppose, since I didn't try to grab him, he figured his strategy had worked. He didn't seem at all concerned about an audience as he wandered along the edge of the road, and he never once looked my way. From a quick bit of internet research I think this guy is an American Bittern; the looks and behavior fit the description. Last night was the first time in awhile I've been able to do Monday Night Dinner, which is now Tuesday because of my weird schedule. I forgot my camera for food pictures, but Kym got some, uh, interesting shots. Be sure to click the photo for a close-up! This morning at long last we were able to have our walk. I got out just before daylight under cloudy skies, and heard a wild bird call that I later realized, upon seeing the bird, was a killdeer. Even in our lovely little community, it's rare that everything is totally still. There's always the distant hum of an engine, the bark of a dog, the low of cattle. But this morning, just as I reached where the dirt road crosses the wandering creek, everything seemed to go suddenly still. Just the ripple of the stream and the soft rustle of leftover rain falling from the leaves. Even the dog paused, head up, body quiet. 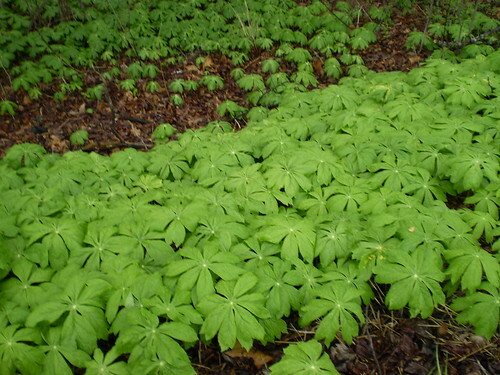 It only lasted moments, then a vehicle passed on the main road and Lily pulled toward an enchanting scent and we walked on to meet our friends.